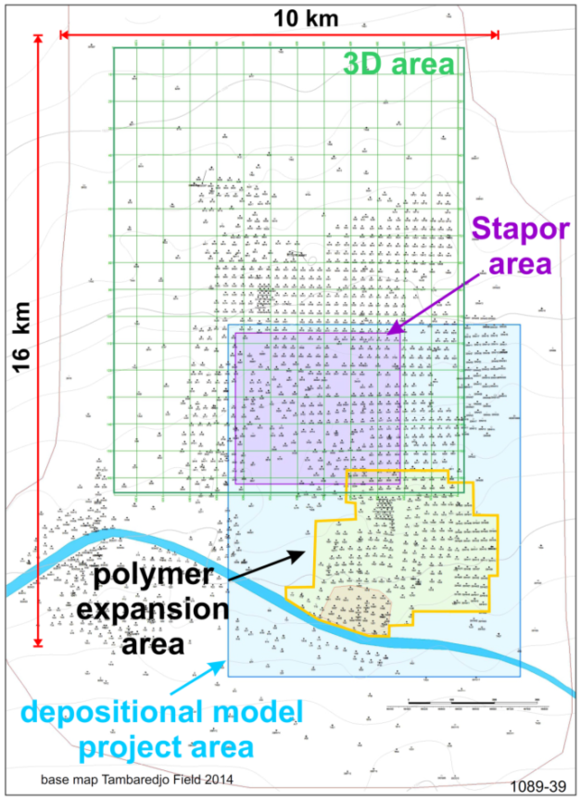 Key objectives of this fully integrated study of the Tambaredjo Field were to develop a new geological model, to investigate the impact of polymer flooding on the displacement efficiency and recovery factor of the heavy crude using the performance of an existing polymer-injection pilot area, and to determine an optimum polymer-injection strategy to further develop the polymer expansion area. Build a conceptual depositional and geological model of the entire Tambaredjo field from 1700 wells. Formulate a detailed geological model using 1290 wells in a smaller area (“Blue area”. Perform petrophysical evaluation and build a static model (Petrel) with 310 wells of the Polymer-Flood-Expansion area (“Yellow area”). Build a dynamic model (STARS) with several history-match iterations, matching individual well-production performances (i.e., oil, water rate, pressure, and also water salinity and polymer concentration changes of wells in the polymer-pilot area). Evaluate possible development options by forecasting the oil-production volumes of multiple scenarios, e.g., by varying the number of additional wells (injectors/producers, vertical or horizontal injectors, water-injection volumes and injection pressures, with/without polymer, polymer concentration, etc.) based on the history matched dynamic model. Build an economic model and assess the economics of different polymer-injection strategies, determine the optimum polymer-injection strategy, and formulate a phased development plan. Tambaredjo field outline, the various study areas and the area covered by 3D seismic.